Many of the skyscrapers built in Cleveland in the late 19th and early 20th centuries have received steel and glass façades that make them appear to be more recent structures and hide any clue as to their historical appearance. 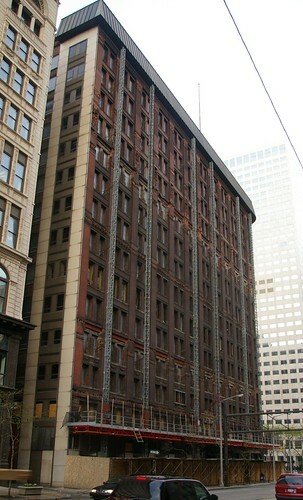 The Schofield Building was one such structure. The building, at the southwest corner of Euclid Avenue and East 9th Street, was built in 1901. The architect was Levi Scofield, who was also responsible for the Cuyahoga County Soldiers' and Sailors' Monument, on Public Square. I can't say the building ever made a significant impression on me. It looked like a non-descript skyscraper built in the 1970s or 1980s. Imagine my surprise when I saw the scene above while walking down East 9th Street to a recent Landmarks Commission meeting. Most of the façade has been removed, revealing the historic structure. A small part of it is still visible on the side of the building at the left of the photo, facing an alley. Note the level of detail present originally. There are Corinthain columns on the corner. Considerable detail is present around the windows. 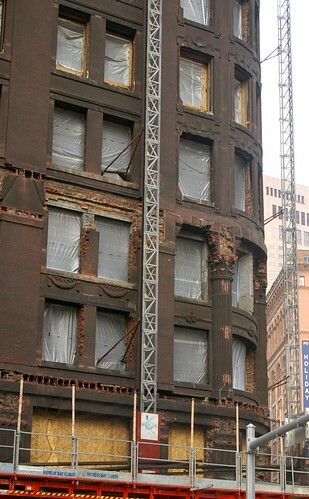 According to this article, published on Cleveland.com on June 8, 2009, the investors who own the group received a $1.25 million loan from the city of Cleveland to remove the façade and determine the original appearance of the building. The article notes that this would be the first step in applying for state and federal historic preservation tax credits. This thread on Urban Ohio includes an excellent historic image of the building. I sincerly hope that the exterior hasn't been damaged too much, and that it can be returned to its original appearance. I have noticed the facade but didn't know what they were doing. It does look very damaged, but I hope they decide to take the time and spend the money to restore it. It has gorgeous details! Any new news on this building? It looks like they are ripping all the architectural detail off... or was it already gone? The details were already gone...What you see here is progress on stabilizing and repair. The State of Ohio recently granted the historic preservation money to help with the project, and it is destined to be condos and either a "Hotel Monaco", or "Hotel Palomar", both of which are brands of the Kimpton boutique hotel chain. The developers are also working on two other historic-facade buildings on Euclid Avenue. Also, if you visit Euclid near E 9th St, just past the Huntington Bldg, you'll see that the decrepit mirrored glass facade on the old BR-Baker Building + it's neighbor have also been removed. There is a wounded, but glamorous cherub floating high above the street with pock-marks from where they chipped away to install the "new" facade. Things are looking up for historic old Euclid Avenue. I look forward to my next visit downtown to take another look. I hope to see more of the same. I am now 71. As a young boy, my parents would take me to B R Baker each Fall to buy a new suit. We would travel there from our home in Lyndhurst via the Redifer (?) bus line. Great memories of a great vendor and downtown experience. Want to Contribute to Cleveland Area History? What was that street named?